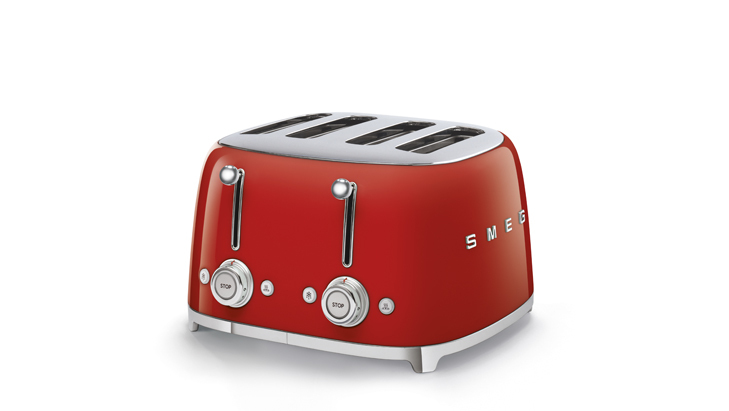 The Smeg 50’s Retro Style family of small appliances welcomes a new product, which is destined to become a style icon in any home setting: the 4 slice toaster. 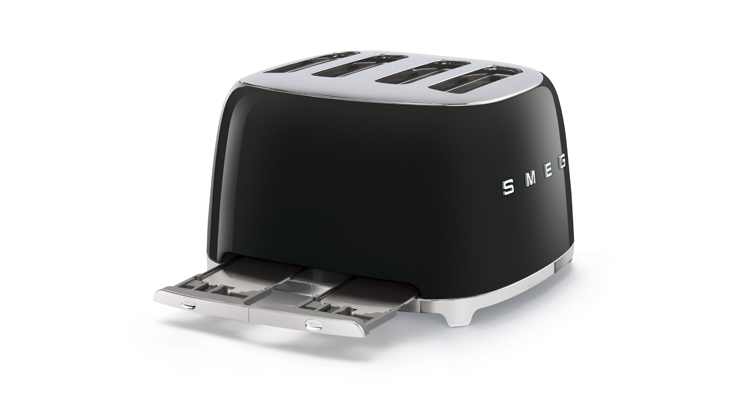 After the 2×2 and 2×4 versions, the new Smeg toaster offers two pairs of spacious, independently-adjustable slots, combining design, reliability and maximum performance. 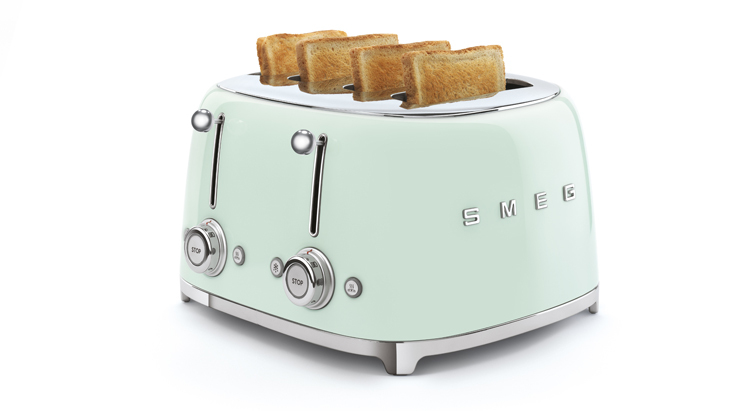 A winning combination of aesthetics and functionality which confirms Smeg’s design expertise in creating products that can deliver those little daily pleasures, from a fragrant, buttery croissant for breakfast, to a tasty slice of toast as a snack or a bagel for lunch or dinner, prepared just how you like it. 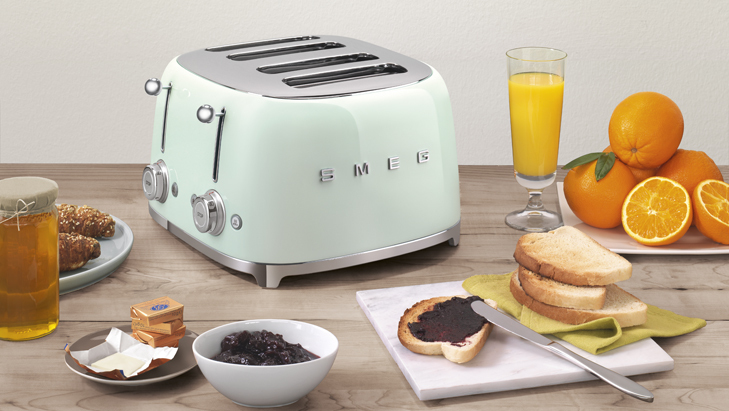 The new Smeg toaster enables you to insert up to 4 slices at the same time, ideal for bigger families, or those who like to start the day with a hearty breakfast for plenty of energy. 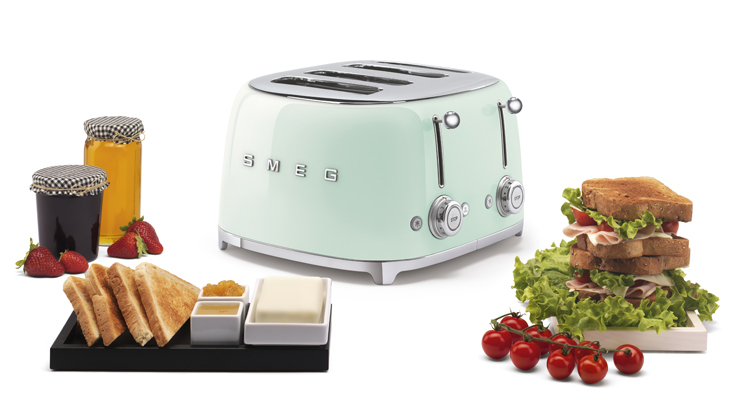 The sleek, rounded lines and the range of colour options available make the new 4 slice toaster an instant winner, perfectly placed within the Smeg 50’s Retro Style family of small appliances: choose from white, black, red or chrome for lovers of bold colours, or from cream, pastel blue, pastel green and pink, for a more vintage look – a host of options that enable you to select a toaster that you will want to show off, perfect for lending any environment a distinctive, unique edge, typical of Smeg appliances. 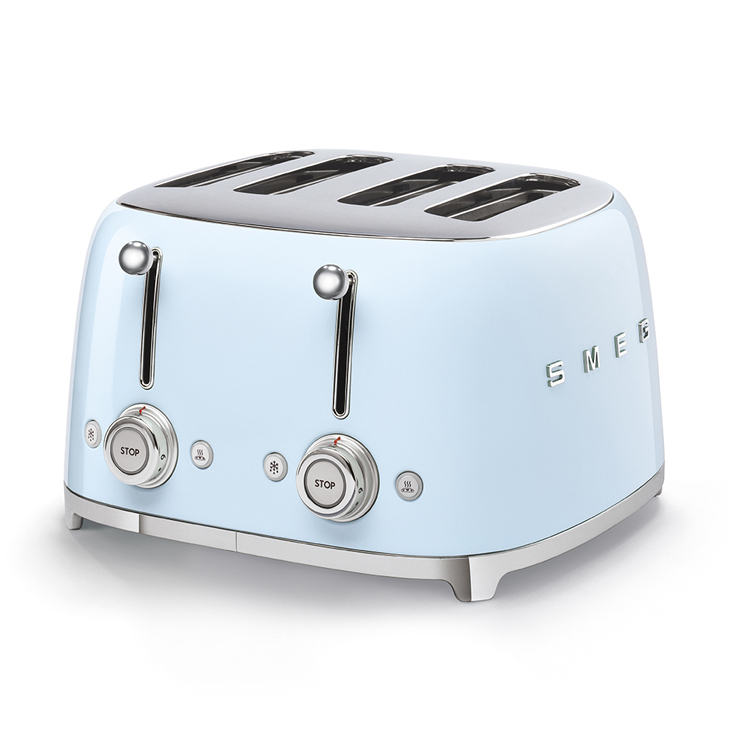 A variety of features place this new addition at the top of the range: with a power of 2000 W, it also boasts two independent control panels and 4 spacious slots (36 mm each), along with slice centring technology with automatic pop-up once toasting is complete. In addition, thanks to the 2 removable stainless steel crumb trays, it is easy to clean both the appliance and the kitchen counter fully after use. 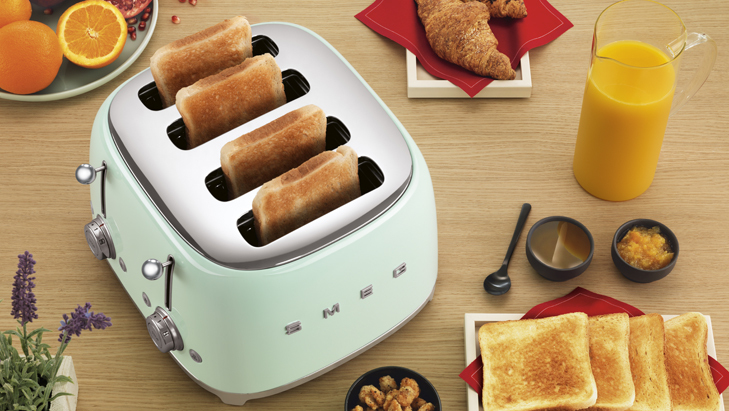 A new icon of style and functionality, designed to meet the practical needs of everyday life. 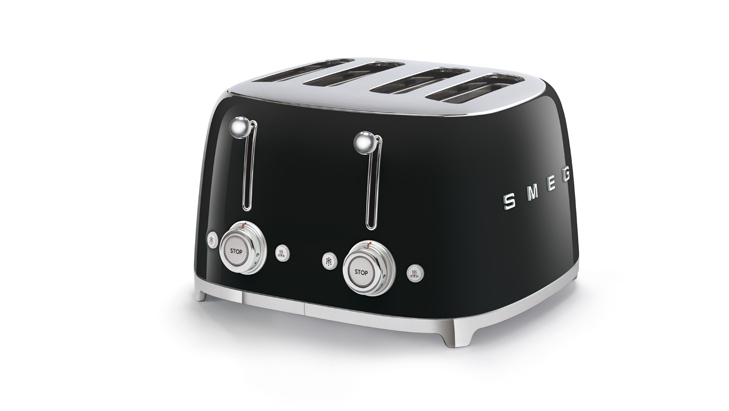 For over 70 years, Smeg has been combining aesthetic and technological research to create appliances that furnish your kitchen with style and functionality: choosing the new 4 slice toaster means selecting a product that truly represents the Smeg philosophy and Made in Italy excellence.